The cup above was produced by Crown Lynn as a souvenir of the Auckland games, which 590 athletes from 12 nations attended. New Zealand came third in the medal tally with 54 medals: 10 gold, 22 silver and 22 bronze. Golds were won in boxing, lawn bowls, rowing, swimming, weightlifting, and athletics. Yvette Williams won a gold medal in the long jump. Two years later at Helsinki in Finland, she became the first New Zealand woman to win an Olympic gold medal. The Empire Games were first held in Canada in 1930. Since then they have been held every four years, although there was a 12-year gap gap after 1938 due to the Second World War. They are now called the Commonwealth Games and sometimes ‘The Friendly Games’. The countries that compete in the games are members of the British Commonwealth, previously known as the British Empire. New Zealand, as a member of both, has been present every time the games have been held. 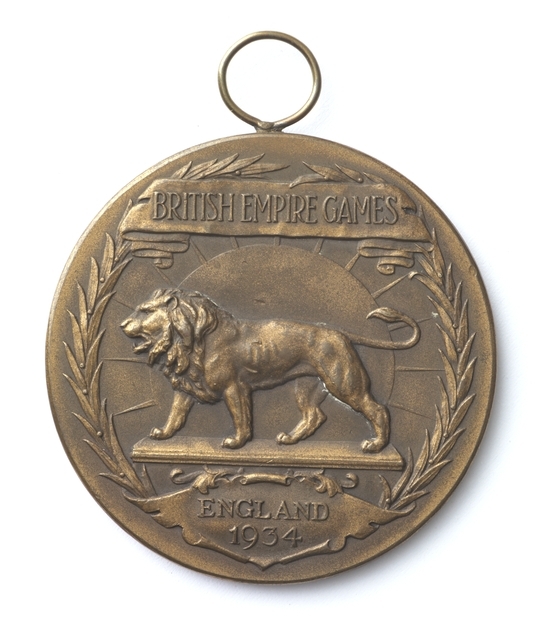 The bronze medal above was awarded to swimmer Noel Crump at the second games held in London in 1934, when he came third in the 100 yards freestyle event. New Zealand hosted the tenth Commonwealth Games in Christchurch in 1974. 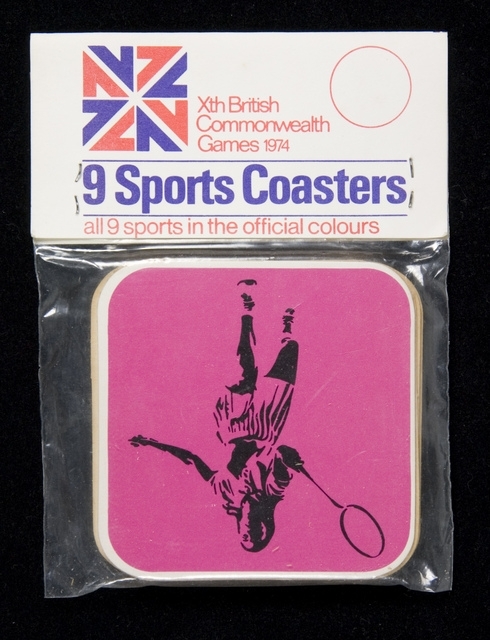 These games were televised and reached a wide audience who enjoyed colour on their tv sets for the first time. There was also an official Games pop song, ‘Join Together’, which reached no. 2 on the pop charts. The distinctive games logo was created by Wellington designer Colin Simon. It cleverly referenced NZ, X (the Roman numeral for 10), and the Union Jack (Britain’s flag). The logo appeared on official team uniforms and souvenirs alike. Auckland hosted the Games again in 1990. These were New Zealand’s most successful, in terms of the number of medals won. The 1990 games were part of New Zealand’s sesquicentennial. This was the 150th anniversary of the signing of the Treaty of Waitangi, which saw New Zealand become a colony and part of the British Empire. Read more about New Zealand and its relationship with the British Empire in Slice of Heaven: 20th Century Aotearoa. 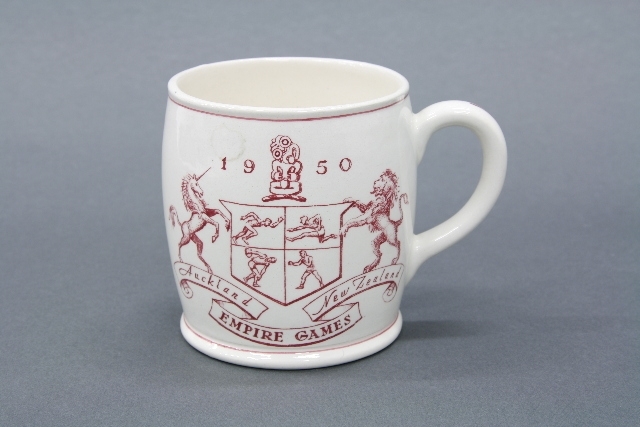 To purchase a 1950 Crown Lynn Empire Games cup, what price would I expect to pay please? Hi Marguerite Thanks for looking at this blog. I’m sorry but can not provide a valuation or provide estimates of a market value – this is stated on our website on the page called ‘Enquiries and Identification’. However you could try a local antique dealer.